I've spent a lot of time watching Disney films, but I knew little about their work supporting the war effort until a few years ago. Todd Liebenow of Forgotten Films did a series on forgotten Disney releases, and it gave me the opportunity to explore that blind spot. I wrote about the remarkable short film Education for Death, a powerful piece of propaganda about the way Hitler corrupts the German youth. Since that time, I've caught up with other examples from that era, including Der Fuhrer's Face and Reason and Emotion. Both show interesting ways that Disney sold the war. Neither has the same ultimate impact at Education for Death, however. It packs quite a punch. With Todd's permission, I've included my 2012 review here of this surprising 1943 short film. One of the lesser-known periods of Walt Disney’s career is his work producing films for the government and armed forces during World War II. The company was reeling financially despite the huge success of Snow White and the Seven Dwarfs in 1937. Disney used recognizable animated characters like Donald Duck to promote the war effort. Some of these short films were designed more for comedy, while others went further and took a more serious route to attack Hitler’s regime. Some of these pictures remain stunning today, especially when you consider the source. Disney’s movies and theme parks are successful because they masterfully deliver a specific message and feeling. His propaganda films were no different and remind us of his tremendous artistic and intellectual talents. One of the prime examples is Education for Death: The Making of a Nazi, a 1943 release that depicts the ways Hitler’s regime indoctrinates kids. Based on a book by Gregory Ziemer, this 10-minute short provides a series of remarkable shots that strike at our hearts. Legendary animator Ward Kimball drives home the message with striking juxtapositions of characters in each frame. 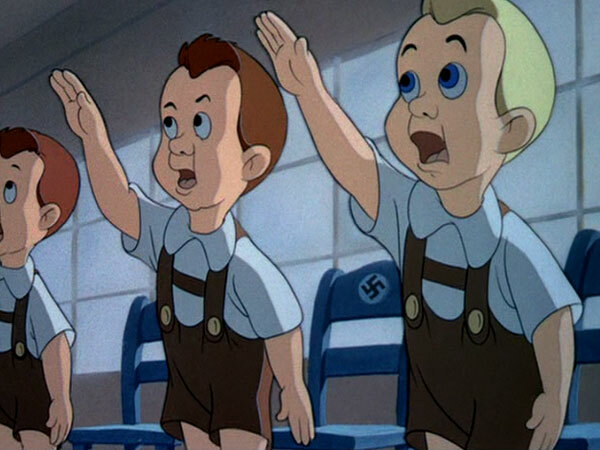 The shot of small boys giving the Hitler salute is effective and clearly delineates the point of this film. Director Clyde Geronimi is trying to show how the enemy is doing more than corrupting its adult citizens. They’re basically taking over their lives at birth and never letting go. The main character is a boy named Hans, and his parents must prove they’re pure Aryans right after he arrives. He never has a chance to do anything but serve Hitler and prepare for war. 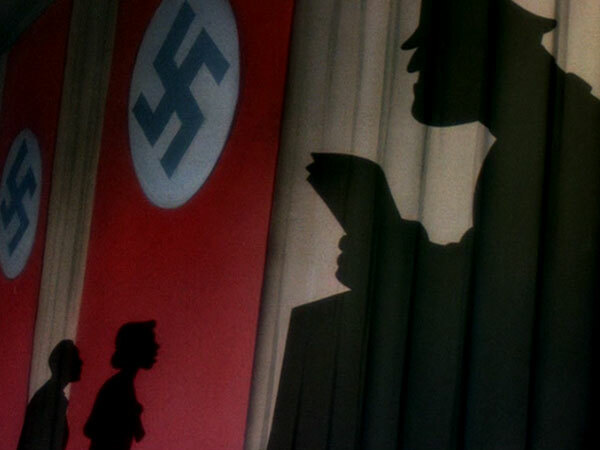 The shadow of the Nazi looms over them and takes up most of the screen as he grabs control of Hans’ life. Art Smith narrates the story, which includes German dialogue and no subtitles. This is another purposeful move to avoid humanizing the Nazis. Having a narrator ensures there’s no doubt about the point of each shot. When Hans grows sick, the footage of his mom with her son reminds us there are humans living under Hitler. While they’re shot warmly, the Nazi soldier is presented like a monster ready to devour Hans. Smith calls him a “superman”, and his giant shadow fits with that over-the-top image of the villain. His teacher looks more like a regular guy, but he’s also a huge man who gets more imposing when Hans counteracts his message. He also ridicules the boy in front of the class — a clever way to show how peer pressure drives the German populace. There are attempts at comedy with the much-different version of Sleeping Beauty that’s reportedly told to Nazi children. This is the only misstep of the movie and could easily have been removed. The joke of the very fat German woman and a goofball Hitler doesn’t work, and it takes Smith’s narration to explain the point. It’s a fairly short sequence and stands out because it feels tacked onto a generally convincing production. It seems designed solely to retain audiences who need generic comedy to stay focused. Once we exit this interlude, the remainder stays grim and on point. The most convincing sequence is the final act, which shows Hans accepting and becoming a full member of the Nazi army. The hellish scene of book burning is enhanced when the Bible morphs into Mein Kempf. We also see the crucifix being replaced with a sword as the violent carnage ensues. While Hans quickly grows up and becomes completely shackled, it’s setting us up for the final shocker. The image of a row of gravestones as far as the eye can see is a definitive mission statement for the movie. 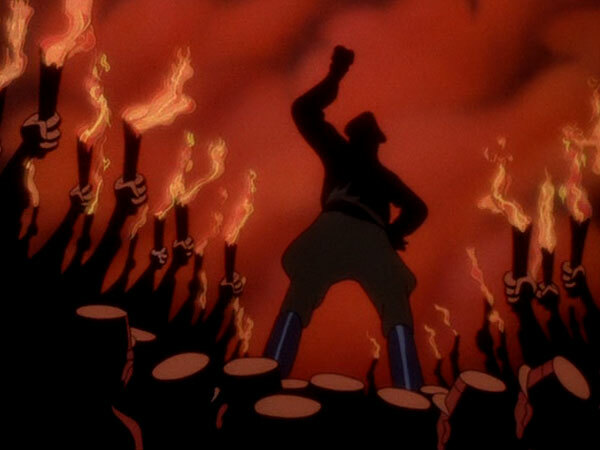 Disney and the U.S. Government paint Hitler as a madman leading his people to ultimate destruction. It’s a classic piece of propaganda that creates a hyper reality from the worst elements of the Nazi regime. It might seem out of character for casual Disney fans, but they don’t really know the company’s namesake that well. He was a politically motivated guy who had more on his mind than creating fantasy. Education for Death is a surprising example from his past that is forgotten or unseen by most viewers. It’s a classic example of war-time propaganda and the rampant possibilities of the animated medium.